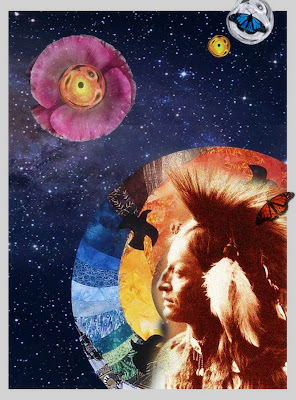 Wisdom from Hopi Elders | on sacred togetherness .. we are the ones we've been waiting for .. Least of all, ourselves. For the moment that we do, our spiritual growth and journey comes to a halt. The time of the lone wolf is over. Gather yourselves! the world has never been without teachers and messengers who's prime responsibility is to deliver the most needed message of the age. "And for every nation there is a messenger ... " affirms Quran (10.47). each age has its teachers. Buddha, Jesus, Muhammad were some of the great ones, but there are always qutubs, special beings who take care of the world. there is something very special about native people because the wisdom of the land are generally spring from there. in every native community such teachers exist who speak from the depth of their spirit, or in another way to put it, they speak from the Universal Soul. each age has its message. there are moments when a particular teacher of the age will speak the message of the age exactly reflecting the need of the time. and when one read this profound message of Hopi Elder from Oraibi region of Arizona, one with enough intuition can tell this is the message of our age. look at every words how deep wisdom outpoured as revelation here. in an age of sickening selfish individualism fused with blind material pursuit, an age of massive self centered delusion that substituted consumerism for true happiness, hoarding more for soulful joy of sharing - it is a message to remind that the time of lone wolf better be over. people must gather themselves. what struck me in the message of the Hopi elder is the call to build community which our beloved Shaykh in Jerusalem, Sidi al-Jamal, may God be satisfied with him, also has been talking and encouraging even students / disciples in United States to build own spiritual community. Shadhiliyya Sufi Center East is one of such community. we are to take nothing personally. nothing belongs to us anyway. all that we do now must be done in a sacred manner and in celebration. the evolution of human consciousness is progressing at the fastest pace than any other time in human history - thus each member of humanity must awaken to this realization that: "We are the ones we've been waiting for." On the same note, the sufis remind all: "The perfect man, the complete man lies within each of us". Indeed "we are the ones we've been waiting for!" Technology of the Heart: Wisdom from Hopi Elders | on sacred togetherness .. we are the ones we've been waiting for ..